"Delivery of the Message of Krsna to the Gopis"
When the gopis understood that Uddhava had a message from Krsna, they became very happy and called him to a secluded place to sit down. They wanted to talk with him very freely and did not want to be embarrassed before unknown persons. "Bumblebee, you are accustomed to drinking honey from the flowers, and therefore you have preferred to be a messenger of Krsna, who is of the same nature as you. I have seen on your mustaches the red powder of kunkuma, which was smeared on the flower garland of Krsna while He was pressing the breast of some other girl who is My competitor. You are feeling very proud by touching that flower, and your mustaches have become reddish. You have come here carrying a message for Me. You are anxious to touch My feet. But My dear bumblebee, let Me warn you–don't touch Me! I don't want any messages from your unreliable master. You are the unreliable servant of an unreliable master." It may be that Srimati Radharani purposely addressed that bumblebee sarcastically in order to criticize the messenger Uddhava. Indirectly, Srimati Radharani saw Uddhava as not only resembling Krsna's bodily features but as being equal to Krsna. 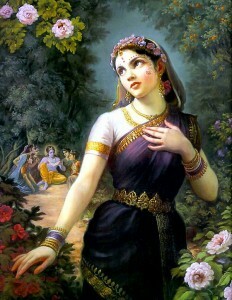 In this way She indicated that Uddhava was as unreliable as Krsna Himself. Srimati Radharani wanted to give specific reasons why She was dissatisfied with Krsna and His messengers. "Your master Krsna is exactly of your quality. You sit down on a flower, and after taking a little honey you immediately fly away and sit in another flower and taste. You're just like your master Krsna. He gave us the chance of tasting the touch of His lips and then left altogether. I know also that the goddess of fortune, Laksmi, who is always in the midst of the lotus flower, is constantly engaged in Krsna's service. 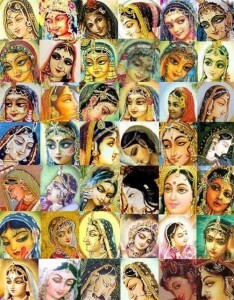 But I do not know why she has become so captivated by Krsna. She is attached to Him, although she knows His actual character. As far as we are concerned, we are more intelligent than that goddess of fortune. We are not going to be cheated anymore by Krsna or His messengers." According to expert opinion, Laksmi, the goddess of fortune is a subordinate expansion of Srimati Radharani. As Krsna has numerous expansions of Visnu-murtis, so His pleasure potency, Radharani, also has innumerable expansions of goddesses of fortune. Therefore the goddess of fortune, Laksmiji, is always anxious to be elevated to the position of the gopis. "You foolish bumblebee, you are trying to satisfy Me and get a reward by singing the glories of Krsna, but it is a useless attempt. We are bereft of all our possessions. We are away from our homes and families. We know very well about Krsna. We know even more than you. So whatever you make up about Him will be old stories to us. Krsna is now in the city and is better known as the friend of Arjuna. He now has many new girl friends, and they are no doubt very happy in association with Him. Because the lusty burning sensation of their breasts has been satisfied by Krsna, they are now happy. If you go there and glorify Krsna, they may be pleased to reward you. You are just trying to pacify Me by your behavior as a flatterer, and therefore you have put your head under My feet. 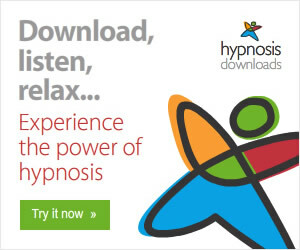 But I know the trick which you are trying to play. I know that you are a messenger coming from a great trickster, Krsna. Therefore please leave Me. 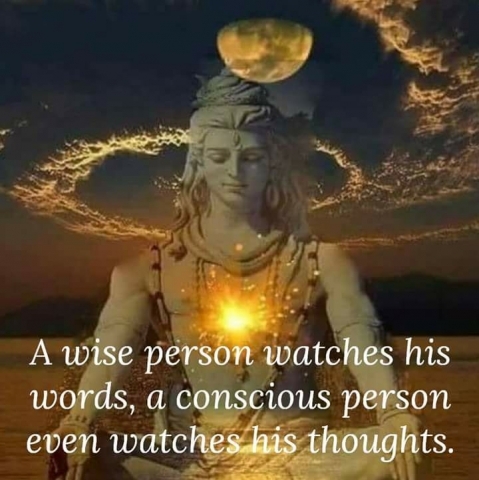 "I can understand that you are very expert in reuniting two opposing parties, but at the same time you must know that I cannot place My reliance upon you, nor upon your master Krsna. We left our families, husbands, children and relatives only for Krsna, and yet He did not feel any obligation in exchange. He has left us for lost. Do you think we can place our faith in Him again? 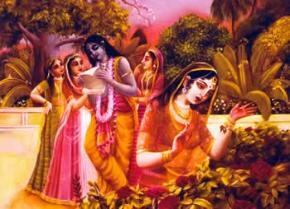 We know that Krsna cannot be long without the association of young women. That is His nature. He is finding difficulty in Mathura because He is no longer in the village among innocent cowherd girls. He is in the aristocratic society and must be feeling difficulty in making friendships with the young girls. Perhaps you have come here to canvass again or to take us there. But why should Krsna expect us to go there? He is greatly qualified to entice all other girls, not only in Vrndavana or Mathura, but all over the universe. His wonderfully enchanting smile is so attractive and the movement of His eyebrows so beautiful that He can call for any woman from the heavenly, middle or plutonic planets. Maha-Laksmi, the greatest of all goddesses of fortune, also hankers to render Him some service. In comparison to all these women of the universe, what are we? We are very insignificant. Krsna advertises Himself as very magnanimous, and He is praised by great saints. His qualifications could be perfectly utilized if He would only show us mercy because we are downtrodden and neglected by Him. You poor messenger, you are only a less intelligent servant. You do not know much about Krsna, how ungrateful and hardhearted He has been, not only in this life, but in His previous lives also. We have all heard this from our grandmother, Paurnamasi. She has informed us that Krsna was born in a ksatriya family previous to this birth and was known as Ramacandra. In that birth, instead of killing Vali, an enemy of His friend, in the manner of a ksatriya, He killed him just like a hunter. A hunter takes a secure hiding place and then kills an animal without facing it. So Lord Ramacandra, as a ksatriya, should have fought with Vali face to face, but instigated by His friend, He killed him from behind a tree. 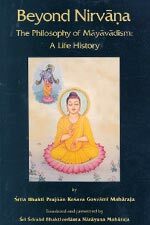 Thus He deviated from the religious principles of a ksatriya. Also, He was so attracted by the beauty of Sita that He converted Surpanakha, the sister of Ravana, into an ugly woman by cutting off her nose and ears. Surpanakha proposed an intimate relationship with Him, and as a ksatriya He should have satisfied her. But He was so selfish that He could not forget Sitadevi and converted Surpanakha into an ugly woman. Before that birth as a ksatriya, He took His birth as a brahmana boy known as Vamanadeva and asked charity from Bali Maharaja. Bali Maharaja was so magnanimous that he gave Him whatever he had, yet Krsna as Vamanadeva ungratefully arrested him just like a crow and pushed him down to the Patala kingdom. We know all about Krsna and how ungrateful He is. But here is the difficulty: in spite of His being so cruel and hardhearted, it is very difficult for us to give up talking about Him. Not only are we unable to give up this talk, but great sages and saintly persons are also engaged in talking about Him. 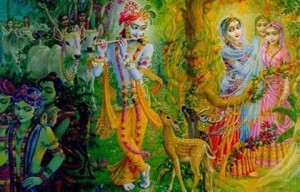 We gopis of Vrndavana do not want to make any more friendships with this blackish boy, but we do not know how we shall be able to give up remembering and talking about His activities." Since Krsna is absolute, His so-called unkind activities are as relishable as His kind activities. 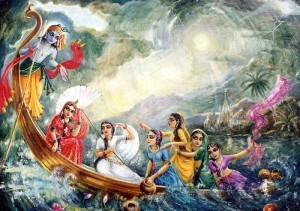 Saintly persons and great devotees like the gopis cannot give up Krsna in any circumstances. Lord Caitanya therefore prayed, "Krsna, You are free and independent in all respects. You can either embrace Me or crush Me under Your feet–whatever You like. You may make Me brokenhearted by not letting Me see You throughout My whole life, but You are My only object of love." "In My opinion," Srimati Radharani continued, "one should not hear about Krsna, because as soon as a drop of the nectar of His transcendental activities is poured into the ear, one immediately rises above the platform of duality, attraction and rejection. Being completely freed from the attraction of material attachment, one gives up the attachment for this material world, family, home, wife, children and everything which is materially dear to every person. Being disposed of all material acquisition, one makes his relatives and himself unhappy. 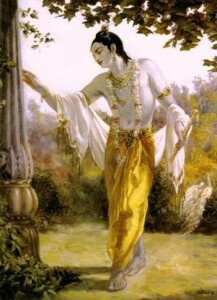 Then he wanders in search of Krsna, either as a human being or in other species of life, even as a bird. It is very difficult to actually understand Krsna, His name, His quality, His form, His pastimes, His paraphernalia and His entourage." Srimati Radharani continued to speak to the black messenger of Krsna. "Please do not talk any more about Krsna. It is better to talk about something else. We are already doomed, like the black-spotted she-deer in the forest who are enchanted by the sweet musical vibration of the hunter. In the same way, we have been enchanted by the sweet words of Krsna, and again and again we are thinking of the rays of the nails of His toes. We are becoming more and more lustful for His association; therefore, I request you not to talk of Krsna anymore." This talk of Radharani with the bumblebee messenger and Her accusing Krsna, and, at the same time, Her inability to give up talking about Him, are symptoms of the topmost transcendental ecstasy, called maha-bhava. 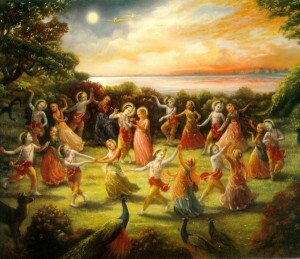 The ecstatic maha-bhava manifestation is possible only in the persons of Radharani and Her associates. While Radharani was talking with the bee and the bee was flying hither and thither, it all of a sudden disappeared from Her sight. She was in full mourning due to separation from Krsna and was feeling ecstasy by talking with the bee. But as soon as the bee disappeared, She became almost mad, thinking that the messenger-bee might have returned to Krsna to inform Him all about Her talking against Him. "Krsna must have been very sorry to hear it," She thought. In this way She was very much overwhelmed with another type of ecstasy. In the meantime, the bee, flying hither and thither, appeared before Her again. She thought, "Krsna is still kind to Me. In spite of the messenger carrying disruptive messages, He is so kind that He has again sent the bee to take Me to Him." Srimati Radharani was very careful this time not to say anything against Krsna. "My dear friend, I welcome you," She said. "Krsna is so kind that He has again sent you. Krsna is so kind and affectionate to Me that He has sent you back, fortunately, in spite of your carrying My message against Him. My dear friend, you can ask from Me whatever you want. I shall give you anything because you are so kind upon Me. You have come to take Me to Krsna because He is not able to come here. He is surrounded by new girl friends in Mathura. But you are a tiny creature. How can you take Me there? How will you be able to help Me in meeting Krsna while He is taking rest there along with the goddess of fortune and embracing her to His chest? Never mind. Let us forget all these things about My going there or sending you. Please let Me know how Krsna is faring in Mathura. Tell Me if He still remembers His foster father, Nanda Maharaja, His affectionate mother, Yasoda, His cowherd friends and His poor friends like us, the gopis. I am sure that He must sometimes sing about us. We served Him just like maidservants, without any payment. Is there any possibility that Krsna will again come back and place His arms around us? His limbs are always fragrant with the aguru scent. Please put all these inquiries to Krsna." 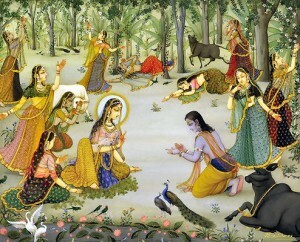 Uddhava was standing near, and he heard Radharani talking in this way, as if She had become almost mad after Krsna. He was exceedingly surprised at how the gopis were accustomed to think of Krsna constantly in that topmost ecstasy of maha-bhava love. Purport: In Krishna, the Supreme Personality of Godhead, Srila Prabhupada explains the meaning of this verse as follows: "[Srimati Radharani said to the bee,] 'You poor messenger, you are only a less intelligent servant. You do not know much about Krishna — how ungrateful and hardhearted He has been, not only in this life but in His previous lives also. We have heard this from Our grandmother Paurnamasi. She has informed Us that Krishna was born in a kshatriya family previous to this birth and was known as Ramacandra. In that birth, instead of killing Vali, an enemy of His friend, in the manner of a kshatriya, He killed him just like a hunter. A hunter takes a secure hiding place and then kills an animal without facing it. So Lord Ramacandra, as a kshatriya, should have fought with Vali face to face, but instigated by His friend, He killed him from behind a tree. Thus He deviated from the religious principles of a kshatriya. Also, He was so attracted by the beauty of Sita that He converted Surpanakha, the sister of Ravana, into an ugly woman by cutting off her nose and ears. Surpanakha proposed an intimate relationship with Him, and as a kshatriya He should have satisfied her. But He was so henpecked that He could not forget Sita-devi and converted Surpanakha into an ugly woman. Before that birth as a kshatriya, He took birth as a brahmana boy known as Vamanadeva and asked charity from Bali Maharaja. Bali was so magnanimous that he gave Him whatever he had, yet Krishna as Vamanadeva ungratefully arrested him just like a crow and pushed him down to the Patala kingdom. We know all about Krishna and how ungrateful He is. But here is the difficulty: In spite of His being so cruel and hardhearted, it is very difficult for us to give up talking about Him.' "